Deaf dog: Frankie, a female Aussie/Dalmatian mix puppy named after Old Blue Eyes. Frankie is now 2 years and still my very special and beautiful dog. She is full of life, still loves chasing those tennis balls. I can't brag about a bunch of hand signals but we have a few of our own. When I leave for work in the morning, I make sure I wave bye to her so she knows I will be gone for a while. I have since acquired four more dog companions for her. They're mostly Chihuahua mixes on the larger scale. She takes them all in stride and knows to what extent she can play with them. Frankie doesn't have a mean side to her character. I know she is a happy dog. I adopted Frankie from the Humane Society working in association with Petco. I was not told she was deaf and made the discovery on my own. I just thank God I got her rather than someone who would have put her down because she is deaf. Or worse yet, just chained her to a tree all day long. Other pets: Canine pet family includes Uno, Chico, Jasmine, Maggie, Annie and Daisy. Two cats who Frankie 'thinks' she is intimidating. 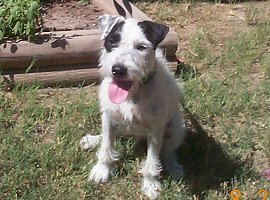 Deaf dog: Champ, a 1 1/2 year old Jack Russell Terrier, is very intelligent and a very happy dog. He loves to learn and he is such a character! He is the love of our life and I am so thankful for that the Jack Russell Rescue offerred him to us! Other pets: We'll be adding a hearing female Jack Russell Terrier to the family soon! 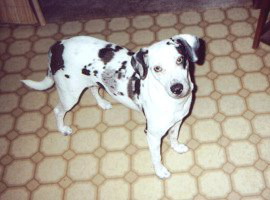 Deaf dog: Mandy is a 5 month old Dalmatian. I was given Mandy by a family that did not want her because they said that she was stupid. I had always wanted a liver brown Dalmatian and here was my chance. I picked her up and within 30 minutes I realized she was deaf. This was confirmed by her Vet. She has been a blessing and a challenge. I have her in obedience school mainly to teach me how to relate to her. She is very smart and because she loves the attention I give her she is doing very well. Mom thinks she is the smartest in her class. 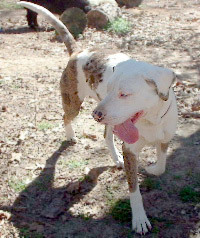 Deaf dog: Harlie is a beautiful Catahoula. She is sweet and super smart, she can learn a new sign everyday. Harlie came from Canton Flea Market, I saw her in a litter and asked if she was deaf because she has a lot of white and was asleep on this busy day. He did not realize it, but she was deaf, so he let me have her. She is our special girl! Other pets: We have 7 personal dogs of our own, and about the same number of rescues right now. One of my personal dogs is my nearly blind 7 year old Siberian Husky, she has cataracts. Deaf dog: Beethoven is a six week old Catahoula. "I rescued Beethoven from being killed because he could not be used for hunting wild pigs, which is what this breed is predominantly used for. He is definitely a mischievous fellow, and his lack of hearing never stops him from running over my other 3 hearing dogs." Human companions: Kristin Lee and her mother, Libby Lee. Other pets: Molly, 14 year old Pekinese; HalfPint, 11 year old Schnauzer; Maxamillion, 3 year old Dachsund; and Jackie, 12 year old Collie/Husky. Deaf dog: We rescued Lady from our local animal shelter. She is a delight. Very spoiled. We didn't realize she was deaf till some time later. She's very well behaved. She had the face at the shelter that said "take me home please!!!" I knew she was a perfect match for our family. Deaf dog: Buddy is a 3 year old Dalmatian. Other pets: Rosie, 6 year old Dalmatian and Tigger, a 3 year old cat. Deaf dog: Shiner's human pal writes: "Shiner is the product of merle, merle breeding. Shiner has been through all the way through intermediate obedience, she has a CGC, and she is also a visitation dog for an animal assited therapy group. Shiner and I have been together a long time, and she is truly a wonderful dog and my best friend."